The esteemed WeGrowOurOwn blog is currently running a seasonal food recipe contest and I was chuffed to learn that my spiced white bean and swiss chard recipe made it to the final round. The dish was adapted from a recipe my mom inherited from the owner of her local Indian grocery. 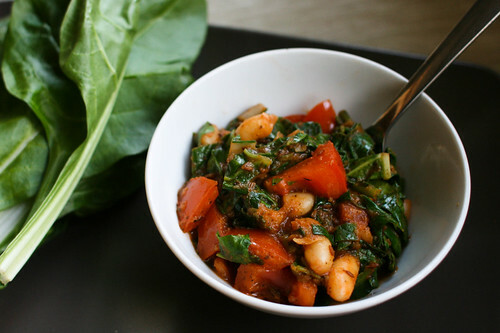 The original recipe called for chickpeas and spinach, but I discovered that cannellini beans and chard turn this into an unlikely fusion of Italian and Indian cuisine, a marriage that works surprisingly well (the ultimate royal wedding?). Consequentially, Choclette (also a finalist in the competition) informed me that this dish does very well with nettles, too!